"... a product of incredible thoughtfulness executed with precision and delivered to the user with smashing ergonomic simplicity." Sound "It is supremely quiet. Notes from the C-03 simply appear, lasting precisely as long as needed and no longer. There is no 'blackness' or space between them, only time. There is no blurring across quick arpeggios; the placement of musicians is not fuzzy. The front edge of attack is natural, not announced or incisive -- as good as Ive heard." "The soundstage went beyond speaker boundaries with exemplary depth.... The C-03 is among the very best at rendering what I call the shimmer of massed strings -- those tiny dynamic differences inevitable within a group of musicians bowing the same note at the same time." "The best image specificity of any preamp Ive heard to date." Features "Responses to my questions from Esoteric engineers laid out the ambitious attentions they paid to signal purity and noise reduction -- no, make that noise elimination -- in all facets of the C-03s design." "The physical topology of the C-03 isolates input, output, power-supply and control circuitry within distinct interior compartments framed by a highly rigid chassis." "The input and output stages for each channel of the C-03 are vertically stacked in their own separated compartments at the preamps rear, immediately adjacent to their respective ports. This reduces signal paths to a bare minimum." "A separate gain level can be set for each input. Related features include +/- 18dB input sensitivity trim control and +/- 3dB channel balance adjustment in 0.5dB increments." Use "Sonically, the C-03 seemed to take several weeks to settle-in and arrive at a final steady character.... Initially I found the C-03 to sound fairly neutral and offer firm transients and a fine dynamic gradient, but instruments were a bit lacking in tonal depth. The soundstage on live orchestral recordings was not particularly deep and lacked the familiar air-of-venue context. I heard an occasional touch of high-frequency hardness on strings and trumpets. But...after a month going forward I heard things differently." Value "Esoterics first preamp honors its viability in high-end audio and joins an exclusive group of the best line stages available today." When the high-end audio division of TEAC decided to build the company's first preamp with the design goal to "reproduce and improve upon the original master tape listening experience," well, you couldnt accuse them of under-promising. With an award-studded lineup of digital players, DACs, transports and other electronica already under its belt after 21 years in existence, Esoteric had cause to aim high and the engineering chops to back it up. Drawing upon design lessons learned from prior products, coupled with in-house mechatronics and craftsmanship, and many, many hours of listening, Esoteric built its first standalone line stage, the C-03. From concept to completion the project took five years. So was it worth the wait? The more I studied and used the C-03, the more I came to believe it is a product of incredible thoughtfulness executed with precision and delivered to the user with smashing ergonomic simplicity. There are many more interesting details about this preamp than I have space to describe in depth, so lets plunge right in. The physical topology of the C-03 isolates input, output, power-supply and control circuitry within distinct interior compartments framed by a highly rigid chassis whose outer dimensions are 17 1/2"W x 5 1/16"H x 15 1/16"D. Esoteric believes that mass is a handmaiden to sonic excellence, reducing vibration on circuit boards and yielding purer sound. With its three adjustable pin-point metal feet attached to a 5mm-thick steel chassis bottom, theres no skimping on metal for this box-within-a-box design. Rear terminals mount on 2mm-thick steel plates, providing three sets of RCA and two pairs of XLR inputs, and two pairs RCA and one set XLR outputs. Theres also a ground lug and an IEC power connector. Up front, a one-line blue LCD display and an on/off switch reside between the two large knobs: one for input selection and the other for volume control. Top, side and front panels are sculpted matte aluminum. Sporting rounded front corners and the Esoteric logo carved into the top cover, the C-03 makes for a classy compact package. The unit weighs a beefy 48 1/2 pounds and retails for $10,000 USD, making it a contender among $10k high-end preamps if you go by pounds per dollar. Responses to my questions from Esoteric engineers laid out the ambitious attentions they paid to signal purity and noise reduction -- no, make that noise elimination -- in all facets of the C-03s design. It isinteresting, then, that the C-03 is not fully balanced, especially because it has XLR inputs and outputs. Lowering noise is an expressed advantage of balanced circuits. The input and output stages for each channel of the C-03 are vertically stacked in their own separated compartments at the preamps rear, immediately adjacent to their respective ports. This reduces signal paths to a bare minimum. The input stage is on top and connects directly to the output below it via an 8Ns (99.999999%) copper cable -- no audio signal runs the length of the case to the volume control located on the front panel. Only the currently selected input circuit is active because both the hot and ground of all other inputs latch open to eliminate noise infiltration from devices not in use. Circuitry perceived as unneeded was eliminated. There are no tone controls and there is no record output. The audio channels of the C-03 are wholly discrete circuits that have their own 200VA toroidal power-supply transformer, which is physically isolated from the I/O boards along with the preamps control circuitry in the front half of the unit. Each output stage is driven by the same muscular rail design (+/-38 volts) found in Esoterics reference D-01 DAC. Esoteric takes the dual-mono configuration a step beyond many other single-ended designs by providing discrete volume control to each channel. through repeated trial listening to compare the sound of variable resistance amplifiers and volume control amplifiers." A single microcomputer instructs each PGA2320 about input sensitivity, total gain (user adjustable to 0dB or 12dB -- more on this below) and channel balance. Further attention to noise elimination finds digital signals separated from critical audio circuits by connecting the microcomputer to the volume controls through optical couplings. A good example of Esoterics quest for ergonomic simplicity through sophisticated engineering is found in the C-03s volume control. Instead of dual mono knobs for adjusting gain, Esoteric takes a drive-by-wire approach with a single volume knob directing the above-mentioned microcomputer by recognizing the position of the knobs pointer through an A/D converter. The physical pointer position is synched between manually turning it and adjusting volume with the C-03s remote control by moving the pointer when the remote is used. As read through the C-03's display, the knobs range is user selectable to straight serial ordination (1-99) or to 0.5dB increments. Its neither clicky nor detented, but it is tuned for what I gauged to be the Goldilocks feel -- it was just right. Youve got to appreciate designers who think about knob torque and engineers who get the implementation right. And if thats not enough slickness for you, when you stop turning the volume knob, the C-03 turns off the microcomputer; even the control sections digital clock is suspended when music plays. To quote Esoteric: "the whole circuit is designed with the sole aim of achieving sound of the highest possible purity." While were on this ode to a knob, a few more points are worth a mention. When I accepted the C-03s default state of zero gain and chose the dB volume scale, it took me a moment to realize this effectively correlates to unity gain: the voltage of the input signal correlates to the top end of the dB readout, which represents the voltage input of the source. This means the readout goes from -90dB (quietest) to 0 (loudest). Turning the volume knob from low to high (left to right) is asking the volume-control amplifier to reduce signal attenuation. It makes perfect sense. However, dont mistake the gain-control system for a simple passive attenuator -- setup offers an added +12dB of amplification. A separate gain level can be set for each input. Related features include +/- 18dB input sensitivity trim control and +/- 3dB channel balance adjustment in 0.5dB increments. The isolation of control functions from the audio output section means real-time changes dont impact sonic quality, and I detected none. Heres a quick mention of other features accessible through setup. You can select and edit predefined device names to display on the display, select to skip inputs when choosing with the input knob or remote, change whether pin #2 or #3 is hot on the XLR inputs (these are different for North America and Asia), and turn off unused outputs. My dedicated listening room is roughly 21'L x 18'W x 8 1/2'H and well treated with acoustic absorbers from RealTraps. I can only rave about these panels -- they greatly improve clarity across the frequencies and are easily the most cost-effective component in my system. Audio Physic Avanti Century speakers sit on the long wall, out into the room and 9 1/2' apart. 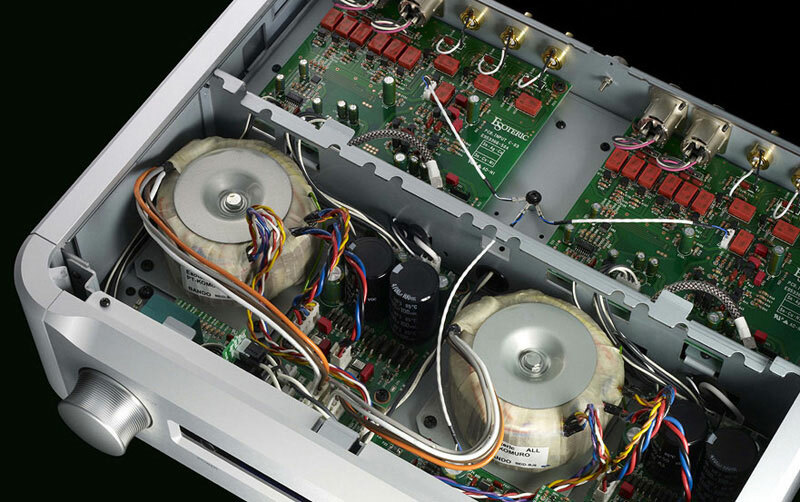 A 140-watt Atma-Sphere MA-1 Mk III monoblock amplifier powers each speaker. Sometimes these are mediated by Speltz autoformers so the amps see an 8-ohm load. 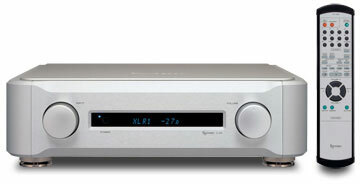 My reference preamp is the Atma-Sphere MP-1 Mk III with built in phono stage. Its line stage uses five 6SN7 triodes and the phono section takes four 12AT7s -- thats tubes per channel. I chose the XLR inputs of both the C-03 and the MP-1 Mk III to receive playback from my multi-format digital player, the Ayre C-5xe. Because of its fully balanced circuitry, the C-5xes XLR connectors offer clearly discernible sonic advantages over its single-ended outputs. Two excellent stand-alone phono preamps were on hand for this review: the solid-state Zyx Artisan and the tube-based Audio Research PH7. As single-ended devices, both connected to the RCA inputs of each line stage. My analog front-end includes a Teres 320 turntable with Verus rim drive, an SME V tonearm, and a Transfiguration Orpheus moving-coil cartridge. I used balanced and single-ended Silver Audio Silver Breeze tonearm cables. I use (and continue to be impressed with) Lloyd Walkers four-step Prelude record-cleaning regimen with my Loricraft PRC-3 vacuum cleaning machine. My system is optimized with a full complement of power cords, power distributors and signal cables from Shunyata Research -- this is good stuff. A Hydra V-Ray power conditioner receives wall current through an Anaconda Helix Alpha power cord and distributes it to each preamp and source component via Python Helix Alpha power cords. The Atma-Sphere amps connect to the speakers with Shunyata Orion speaker cables and use Taipan Helix Alpha power cords plugged into a dedicated Hydra fed by another Python Helix Alpha. All balanced interconnects are Shunyata Antares and single-ended cables are a mix of Shunyata Antares and Aries. I used the C-03s remote control to access its setup options and tweak volume levels from my listening chair. The remote is large and includes all the standard functions for operating a digital player -- functions I did not use. I opted for the unity-gain default mode during most of the review period. Sonically, the C-03 seemed to take several weeks to settle in and arrive at a final steady character. After making a few early notes, I listened to background music only for a month while leaving the unit on all the time. Initially I found the C-03 to sound fairly neutral and offer firm transients and a fine dynamic gradient, but instruments were a bit lacking in tonal depth. The soundstage on live orchestral recordings was not particularly deep and lacked the familiar air-of-venue context. I heard an occasional touch of high-frequency hardness on strings and trumpets. But keep reading -- after a month going forward I heard things differently. It was one of those being-in-the-moment moments that music has such special power to evoke. Evgeny Kissin was well into the "Sehr innig und nicht zu rasch" movement of Schumanns Kreisleriana (RCA Red Seal 82876-59412-2). Hed lapsed out of look- how-fast-I-can-play mode, his touch becoming thoughtful and moving, true to the romance of the work. I was wrapped up in the music, and my notepad and pen were down. Then I heard the crickets, and I finally got it. Or better perhaps, the Esoteric C-03 finally got me. Into my second month with it, the first of serious reviewing, I was wondering if Id yet taken the C-03s full measure or if there was something more to it besides being a solid, competent preamp, and just that. Then there they were, appearing out of nowhere, but in reality just on the other side of the one window on my listening room -- a Greek chorus wailing their lamentations stage right. Theyd been at it awhile -- long before I realized what I was hearing. With apologies to the composer, I sensed no difference between live cricket music and recorded Schumann music. I knew then just how right this Esoteric preamp was. It is supremely quiet. Notes from the C-03 simply appear, lasting precisely as long as needed and no longer. There is no "blackness" or space between them, only time. There is no blurring across quick arpeggios; the placement of musicians is not fuzzy. The front edge of attack is natural, not announced or incisive -- as good as Ive heard. Listen how interior woodwind solos spring to life in Sibeliuss Second Symphony under Barbirollis baton on Chesky CD (Chesky CR3) or in Stokowskis rendition of Smetanas "The Bartered Bride" on his Rhapsodies LP (RCA/Classic LSC-2471). Oboes nicely contrasted with bassoons, tonally and spatially. It was audibly easy to spot the positions of flutes relative to the clarinets. However, perhaps because of its quietness, the C-03 seemed to better represent musics natural drive and vivacity when fed from the Ayre digital player than from either of the phono stages on hand. Its the first component in my system that led me to play more CDs than I usually do. Maybe Esoteric's expertise in making digital gear has something to do with this. Soundstage perspective was on a low-angled oblique, yet the front-to-back layering of musicians within the orchestra was precisely obvious. Cellists appeared, their instruments sounding with strength and radiance as bow motions came easily to my imagination. When their time came to perform, entire sections appeared upon the soundstage fully formed. Notes from instruments evinced with clarity in decay and an exquisitely fine-spun dynamic gradient that extended out the fullness of their harmonic information -- until they stopped and again there was nothing. "Die Moldau" from Smetanas M� Vlast (also on the Stokowski record) let the C-03 further show off its strong suits. The soundstage went beyond speaker boundaries with exemplary depth. Violins during the "Night Faerie" section sparkled with extended finesse and delicacy. The C-03 is among the very best at rendering what I call the shimmer of massed strings -- those tiny dynamic differences inevitable within a group of musicians bowing the same note at the same time. Trumpets and horns had believable tonal density without any hint of glare, and their placement within the orchestra was consistently exact. After a month of break-in, there was none of the faint high-frequency hardness I heard initially. Playing two or more octaves above middle C, violins and piccolos were marvelously extended with clarity and definition. If I had to pick nits, Id say cellos and basses were a teeny bit bloomy around the edges and not quite as defined as other instruments playing in higher frequencies. Yet there was good weight and heft to the fundamental as the C-03 firmly drove my Atma-Sphere amps. The Esoteric preamp gave me some of the best reproduction Ive heard of a favorite choral piece -- Gerald Finzis Intimations of Mortality performed by tenor Ian Partridge and the Guildford Philharmonic Choir & Orchestra under Vernon Handleys baton on Lyrita LP (Lyrita SRCS 75). Ive listened to this music with every review component that has passed through my system; I know it well and my compliment is genuine. Although the choristers were not quite as three-dimensional with the C-03 as Ive heard, they were well individuated, sonically and spatially layered, and they presented with an excellent tonal and dynamic gradation -- the choral analog of string-section shimmer. Soundstage width positioned triangle and xylophone well outside the speakers and to the rear -- if I could stake their spot with a sticky note hung in thin air, it would mark the back-right corner of the orchestra. The metal-on-metal tone of the triangles strike was just right, with a crisp front edge. A big acoustic band with a big choir all going at it at once is one of the true challenges for any stereo rig. You may have thought the Esoterics +/-38-volt output buffer a tad exuberant, but the musics resolution and coherence never blinked under the steadiness of its reserve. The C-03s low noise floor and its facility with dynamics and timing delivered the vivacity and power of the orchestra and choir performing together without muddle or confusion in complex passages. Whether its the short signal paths or high-grade WIMA caps I cant say, but that low noise floor yields a highly resolved presentation that gets cashed out as the best image specificity of any preamp Ive heard to date. Couple this with expressive microdynamics in the mids and highs, along with realistic instrumental and vocal timbres, and the C-03 delivers a wonderfully satisfying listening experience. Rare with many components that pass through my system for review, I came to look forward to listening sessions with the C-03. It was a good thing to have a truly great reference preamp for comparison with the C-03. My Atma-Sphere MP-1 Mk III with phono section ($12,100) sports a V-Cap upgrade and a few strategically placed 52 Sylvania 6SN7 bad boys. I used the tubed Audio Research PH7 and solid-state Zyx Artisan phono stages with each preamp and also compared the MP-1 Mk III natively to the C-03-plus-PH7 combo. The lineage, architecture, and implementation of the C-03 and MP-1 Mk III couldnt be more different, and no doubt this is reflected in their sonic characters. Despite these differences, both preamps yielded the result of high enjoyment while honoring the music. I would love to eavesdrop on a discussion about music and component design between Motoaki Ohmachi (president of Esoteric) and Ralph Karsten (Mr. Atma-Sphere). Beneath the mechatronics, handcraftsmanship, logic processors and tubes, their products reflect a common passion in pursuit of musical realism. The capacity for music to express irrepressible human joy finds no better spokesman than Beethoven. My notes detailed impressions gathered from a back-to-back comparison using the ARC PH7. My sonic lens was Bs Symphony No.6, "the Pastoral," superbly performed by the Berlin Philharmonic under the baton of Andre Cluytens (EMI ASD 433). Overall, the MP-1 Mk III sounded more immediately alive, in a raw, visceral sort of way. It gave a bit better sense of an orchestra in the space of a concert hall, a sense of the distance between the orchestra and back and side walls. Soundstage width, depth, and height were top-notch with both preamps, though slightly wider with the C-03. I heard less surface noise through the MP-1 Mk III, but the C-03 was quieter when no music played. In the "Scene at the Brook," woodwinds through the C-03 were better outlined with a clean-cut focus; however, harmonics and overtones were just a touch richer through the MP-1 Mk III. Through the MP-1 Mk III, individual musicians had greater three-dimensionality and instruments took on a vivacious "lit from within" quality. The C-03 impressively laid out the orchestra with clear image placement front to back. Overall each preamp showed excellent articulation, but the Esoteric line stage offered cellos and basses with a faintly clearer leading edge, as I heard their bows' rosiny attack with slightly fuller low-end body. Both preamps gave different but equally compelling renditions of Dmitrij Kitajenko conducting the G�rzenich-Orchester K�ln in Shostakovichs 12th Symphony, "The Year 1917" on SACD (Capriccio SCD 71 037). If you like the bombastic side of Shosty, here is your piece -- after all, it is revolutionary. Step by ponderous step, the inexorable carapace of proletarian praxis rides athwart the imperial walker of historical inevitability. The C-03 gave full measure to a chorus of growling trombones and giant bass drum-strikes in the final movement. There is no joy here, only the inevitable crush of synthesis, the sledgehammer of history delivered in huge dynamic swings of massive timpani whacks and cymbal clashes. Both preamps laid out the orchestra before me. Here again the MP-1 Mk III offered an open, spacious presentation -- a bigger, more dimensional sound, with more air, while the C-03 exhibited refinement and specificity with a tailored sense of realism. The C-03 showed no hint of shyness when called upon to deliver the full power and scale of the music. The MP-1 Mk III yielded a marvelous clarity of intonation in the midbass and lower bass, while the C-03 had more heft and sheer grunt in the low end. A giant gong strike made with a soft mallet spread outward in a circular pattern like ripples on a pond. The C-03 got it just right, and I felt a deep resonance as the pressure wave of its frontal assault moved through me. From a satisfaction perspective, each preamp was difficult to switch to from the other, yet neither ever disappointed upon arrival. Both were true to the music at hand, and both showed assurance driving the Atma-Sphere amps. If I had to boil it down to one word, Id say the MP-1 Mk III is "transparent" while the C-03 is "sophisticated." Which would you prefer? Its a hard choice to make. I prefer having a fully balanced system -- i.e., using the Atma-Sphere preamp with the Atma-Sphere amps -- but I could live with either preamp. There is no best here. With the C-03, Esoteric brings to market a thoughtful design with top-notch build quality and pleasing ergonomics. It is fast, quiet, and highly resolving with superb microdynamics, and best-of-breed image specificity. It wont congest or smear complex music delivered across a broad dynamic range. Notes are articulate with a naturally crisp leading edge. The C-03 delivers graceful fluency backed by quiet strength. It is a very compelling component that consistently drew me into the music. Im told the first-year anniversary gift is paper, and for ten years it's tin, but who knew that 21 years is a preamp? Esoterics first preamp honors its viability in high-end audio and joins an exclusive group of the best line stages available today. I hope the engineers at Esoteric dont wait 20 more years to make another.